The cause of the tension between Rin and Kouki finally gets some explanation in Bunny Drop Volume 6. 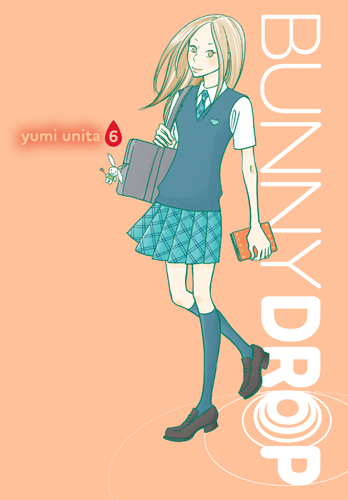 Note: Bunny Drop Volume 6 is, of course, the sequel to Bunny Drop Volume 5. 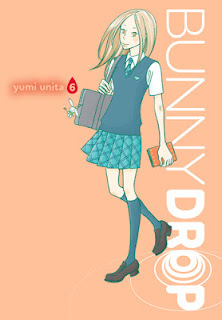 The review of Bunny Drop Volume 1 is here, and the review of Bunny Drop Volume 5 is here. Otherwise, read on! This volume gives us some much-needed flashbacks to Rin's middle-school years. After the jump, it was hard to tell exactly what had gone on in the intervening years, but it was certainly something unhappy. Then again, most people don't have the most pleasant of time in middle school. It looks like she and Kouki might have had an even harder time than normal, though. Kouki has always been something of a handful, and growing up with just his mother hasn't been the easiest for him. He's fallen in and out of the wrong crowd a few times, and that's been especially hard on Rin. Rin has had a terrible time with bullies, especially in the cyberbully arena. A girl who set her sights on Kouki early has made it her mission to torment poor Rin. Kouki, unfortunately, seems to have inherited some of the 'clueless male' from Daikichi and has had a hell of a time dealing with the crazy Akari-senpai. But then again, what does a middle-school boy do when a girl declares herself your girlfriend, and threatens you and your best friend if you disagree? Kouki has a good heart, and would never dream of hurting anyone. In fact, ever since elementary school, he's seen himself as Rin's protector. Now that they're in high school, though, their situation will continue to have its own problems. Even though Akari-senpai has graduated high school and is now at a prestigious women's college, she'll still find ways to interfere in their lives. But this time, perhaps it's Rin's turn to protect Kouki. Volume 6 brings the series back to the excellent storytelling and painful choices that readers are familiar with in the earlier chapters, and even if most of the hard choices are of the high-school type, at least the heart of the story is still there. Highs: Rin really is a strong young lady when she needs to be, and especially when one of her people are threatened. Lows: The scenes between Daikichi and Nitani are getting more and more uncomfortable to watch, and I wish we'd stop going back there unless something is going to change. Verdict: So much better than Volume 5, and I eagerly anticipate the next volume's release.